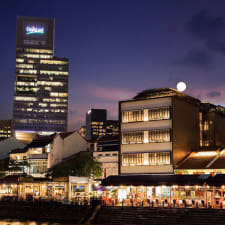 Heritage @ Clarke Quay offers apartment accommodation near to Singapore’s Central Business District, with the modern facilities suitable for both business and leisure travellers. All rooms are fully air-conditioned and include 32-inch LCD flat-screen cable television. The beds are furnished with luxury linen, while the kitchenette includes a refrigerator, toaster and kettle. There is a dining table too, along with modern shower facilities. The minimum stay at Heritage @ Clarke Quay is seven nights, and long-term rentals are available. There are four apartment sizes available, with the largest being a spacious loft space. Communal laundry facilities are available, and Wi-Fi is free throughout. Hairdryers are provided. There are plenty of eating options nearby, including Wakanui Grill Dining and the Tong Fu Ju Sichian restaurant, while popular local pubs include Hood Bar and Café along with Molly Roffey’s. The Parliament House is just a seven-minute walk away, and City Hall MRT Station is a 12-minute walk. Changi Airport is 20 kilometres away. In terms of the convenience of the location, guests love it. For business guests the apartments are right near to the Central Business District, and the apartments are close to transport links for getting around Singapore. There are lots of dining and drinking options for on an evening too. A common theme throughout the reviews is the friendly, welcoming nature of the staff. Guests are quick to praise them, saying staff are always ready to help. Several staff members are name-checked positively in reviews which can only be a good thing. If you are lucky enough to stay in a room with a view, then you will surely enjoy it as much as past guests. The views from the apartments are said to be stunning and really do help to elevate the quality of their stay to another level. Guests have said that, despite the modern facilities, there are some space issues with the smaller rooms. There are reports from guests of beds being close to walls, for example, which can make it a tight squeeze to get in and out if there are two in the bed. One of the problems with staying in such a central location is the possibility of external noise. Not only is the hotel situated on a quay, so there is the noise from the boats, but guests report there are some noisy bars nearby too. Guests say that if you leave the windows open during the night, the music can be a disturbance. Though not a major problem, guests have reported problems with the lift being unreliable. This has proven to be an inconvenience as it has meant carrying luggage up several flights of stairs.